The Problem: Spatial thinking is essential for success in a wide variety of fields, including the STEM (science, technology, engineering and mathematics) disciplines. However, spatial thinking skills are often neglected in our educational system, so many students arrive in college without having the benefit of practicing and honing these skills. The Solution: We are developing teaching activities to strengthen geoscience students' penetrative thinking skills: the ability to visualize spatial relations inside an object. Although many people erroneously believe that 3-D thinking skills are genetic -- you either have them or you don't -- a preponderance of research shows that they can be taught and learned, just like any other skill. (How hard you have to work to learn them does vary.) The spatial thinking workbook exercises presented here require students to visualize slices through a variety of objects, both geological and non-geological. The exercises build from simple to complex, scaffolding students' penetrative thinking skills, and use instructional strategies suggested by cognitive science research. We are testing these exercises in three different undergraduate geoscience classes (Mineralogy, Sedimentology & Stratigraphy, and Structural Geology) at three different institutions (Louisiana State University, the University of St. Thomas, and the University of Wisconsin, Madison), to measure their effectiveness at improving students' spatial thinking. 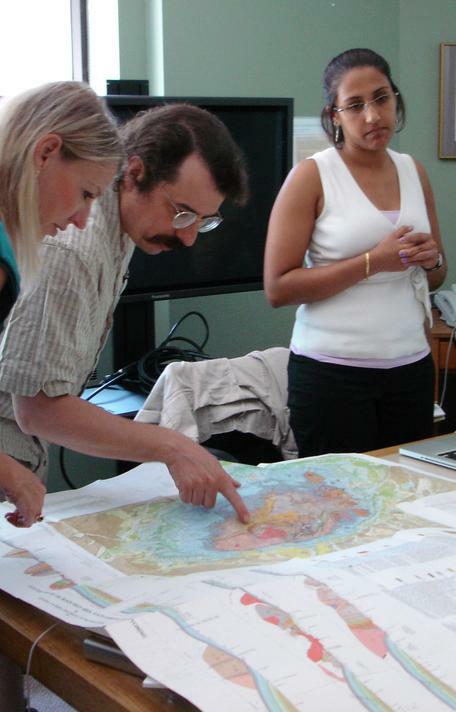 The Significance: Being able to successfully visualize the interior of objects at all scales, from planets to oceans to regional outcrops to hand samples to microscope slides to the atoms within minerals, is a core geoscience skill. Furthermore, students with strong spatial skills are more likely to persist in STEM fields. Therefore, improving the spatial skills of all students in geoscience classes will increase the pool of students, including students from underrepresented groups, who are likely to pursue careers in the STEM fields. This approach, which extends previous work in engineering, will provide a model for other disciplines. This project is supported by the National Science Foundation (NSF) Division of Undergraduate Education, grant #1044245. Any opinions, findings, and conclusions or recommendations expressed in this website are those of the authors and do not necessarily reflect the views of the National Science Foundation.